Todd Genger, a 33-year-old attorney for Goldman Sachs, was arrested yesterday for soliciting an undercover cop that he thought was a 15-year-old girl. That’s criminal. Reaping billions in profit from surreptitious taxpayer bailouts, however, remains perfectly legal. Ya gotta wonder. 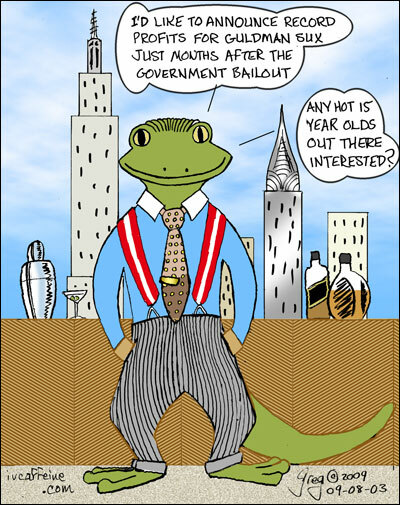 Then again–what else could be more in keeping with the reptilian company that gamed the US into GIVING it profits? We’ve reached the slow season folks and this cartoonist needs some time off desperately to take care of other business so for the month of August, we will be publishing Mondays only.